So we didn't make it to trunk or treat till 6:15ish. We hit a few houses close to the church, then headed to Grandpa Funks house. 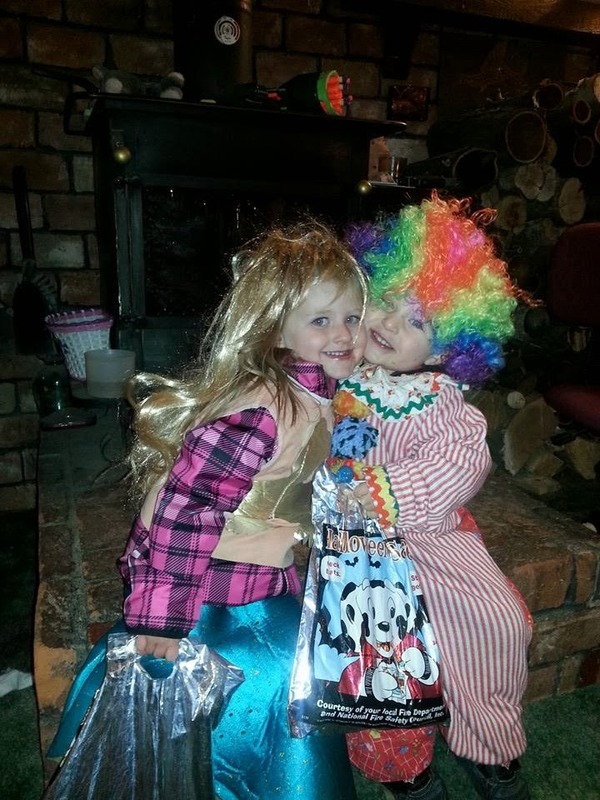 Addison originally wanted to be a princess this year, but after seeing (and wearing) Taylor's Mermaid costume, she wanted to be a mermaid. I had her talked back into doing the princess thing (I really didn't want to buy costumes this year) but Grandma Jensen came to the rescue. She brought over her old Halloween box which contained the mermaid costume I wore when I was Addison's age! She even had a fun super long wig! Brogan wanted to be a clown this year- and thanks again to Grandma for the rescue! 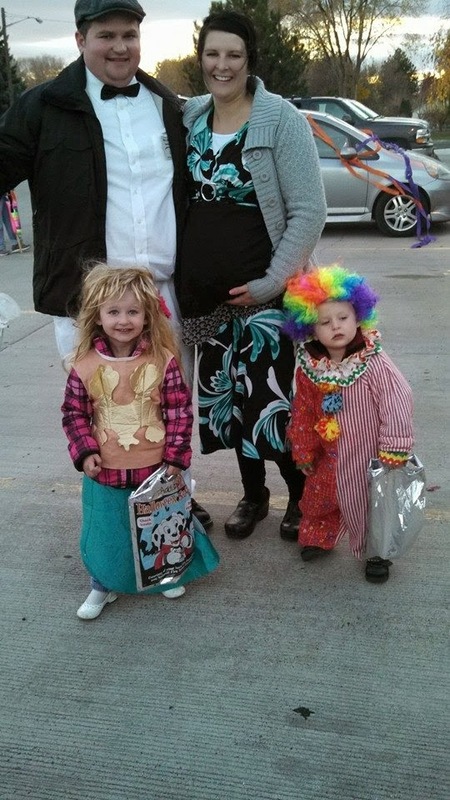 That's also the same clown costume that my siblings and I all wore time and time again! 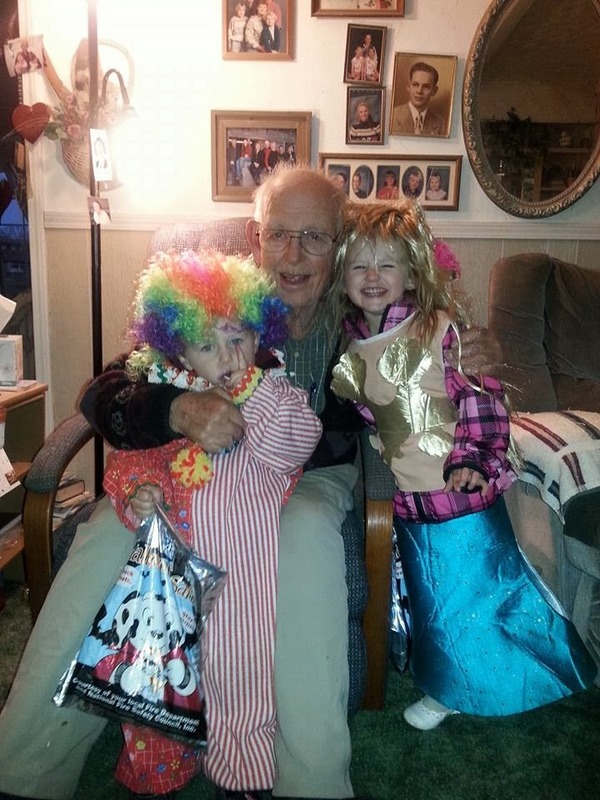 I love to dress up for Halloween (probably more now then when I was younger). 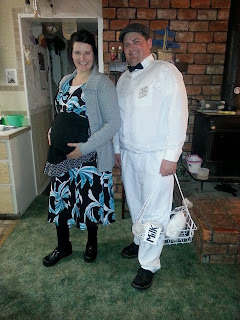 Stewart and I went as the Milkman and the pregnant housewife. His name badge read "Mike's Milk Service, We Make House-calls, Best Service in Town" ;) We got some good laughs. After hitting our traditional Wendy Robinson then Pine Street circle trick or treat route, we headed home. I was surprised at how much Addison liked the spooky stuff. She went into the dark "haunted trailer" at trunk or treat, even though there were bodies lying all around trying to grab her. She also loved all of John Flora's spooky yard decorations. She would have stayed there for another ten minutes just checking everything out! Brogan on the other hand takes after his Momma- spooky was not his favorite! It was a good Halloween. A candy tax was collected by this Mom, and I am already trying to stash it all in places that the kids will never suspect (cause they want it all RIGHT NOW... and they don't handle their sugar very well...) So until next year- Happy Halloween!